Head to Sydney Fish Market and Queen Victoria Building (QVB)for some retail therapy. 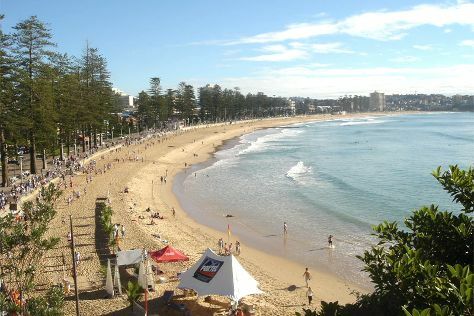 Step out of the city life by going to Manly Beach and Dolphin & Whale Watching. Explore the numerous day-trip ideas around Sydney: Leura Mall (in Leura), Katoomba (Wentworth Falls & Blue Mountains) and Shelly Beach (in Manly). Spend the 2nd (Wed) exploring nature at Sydney Harbour National Park. On the 6th (Sun), dedicate a day to the elevated beauty of Perry's Lookdown. And it doesn't end there: tour the pleasant surroundings at Bondi Beach, revel in the low prices at Birkenhead Point Brand Outlet, hike along The Opera House to the Botanic Gardens Walk, and admire the masterpieces at Brett Whiteley Studio. To see other places to visit, traveler tips, reviews, and more tourist information, refer to the Sydney vacation tool . If you are flying in from China, the closest major airport is Sydney Kingsford Smith International Airport. September in Sydney sees daily highs of 25°C and lows of 14°C at night. Cap off your sightseeing on the 6th (Sun) early enough to travel back home.